UPDATED: Tue., May 22, 2018, 8:08 a.m.
PERRY HALL, Md. – A 16-year-old boy has been charged with first-degree murder in the slaying of a Baltimore County, Maryland, police officer, and three other suspects are still being sought, authorities said Tuesday. A statement of probable cause dated Tuesday identified the suspect as Dawnta Anthony Harris of Baltimore and the officer as Amy Caprio. Police have not confirmed how Caprio was fatally injured in a suburban neighborhood Monday, but witnesses reported hearing a pop before seeing a Jeep run her over. Meanwhile, officials said Tuesday that three additional teenagers had been taken into custody after the officer was killed. Baltimore County’s public safety department tweeted Tuesday morning that the teenagers are suspects in area burglaries. The department did not say whether the three played any role in the officer’s death. Harris, who was arrested near where a Jeep was found abandoned, told a detective he had been waiting in the driver’s seat of the vehicle as other associates of his were in the process of committing a burglary, according to the probable cause statement. Harris also told the detective that he “drove at the officer,” the statement said. Scott Shellenberger, the state’s attorney for Baltimore County, told the Associated Press the teen has been charged as an adult. The Associated Press does not ordinarily identify underage suspects unless they face adult charges. The records don’t list an attorney for Harris, and attempts to people believed to be his family members were not immediately successful. He was scheduled to appear before a judge at a Towson courthouse at 1 p.m. Tuesday. 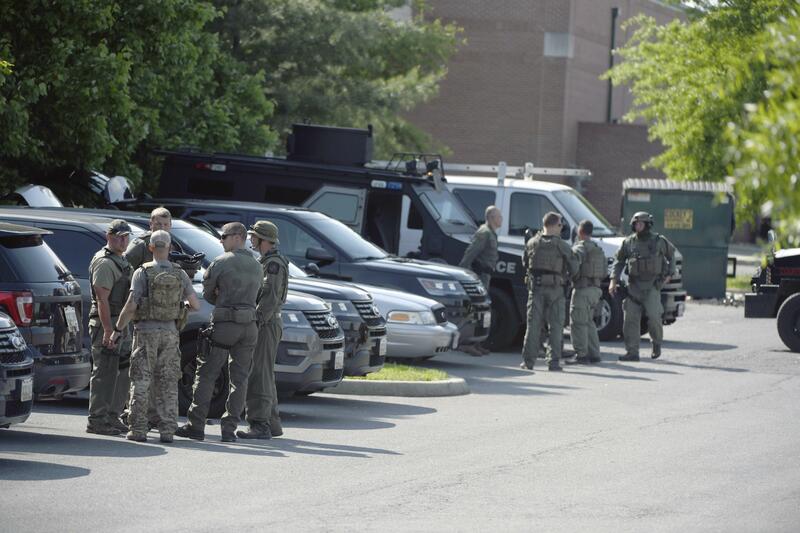 Meanwhile, police continued scouring a greater Baltimore suburb for three other suspects. Baltimore County Police Cpl. Shawn Vinson said the officer went to investigate a call about a suspicious vehicle when she encountered at least one suspect and was “critically injured.” He added that the confrontation may have stemmed from a burglary in progress, noting one home on the block had damage to a patio door. Events began unfolding Monday afternoon in the leafy neighborhood of single-family homes. It was then that Kurek’s neighbor, Dahle Amendt, said he had just settled into his recliner for a rest when he heard a woman’s voice outside his house. “I heard, `Get out of the car!’ `Get out of the car!’ Get out of the car!’ at least three times, and then a pop,” Amendt said. Published: May 22, 2018, 8:07 a.m. Updated: May 22, 2018, 8:08 a.m.